Place the Cheddar cheese, cream cheese, mayonnaise, garlic powder, cayenne pepper, onion powder, minced jalapeno, and pimento into the large bowl of a mixer. Beat at medium speed, with paddle if possible, until thoroughly combined. Season to taste with salt and black pepper. 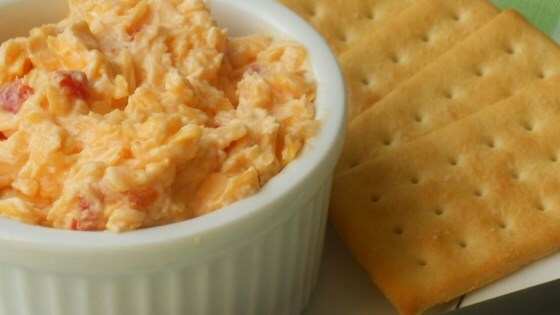 This is exactly the way I've always made Pimento Cheese (minus the jalepeno). I took some to work once and 4 people told me it was the best they've ever had. Yum!